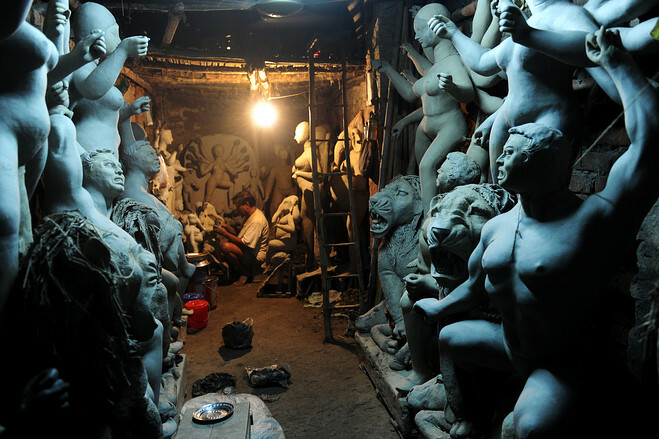 Kumartuli is the place where the artists make the idols or figures of different gods or goddesses. In Kolkata you may find the place Kumartuli. It is nothing but potters’ quarter where they make the idols during the year and also use it as their abode. Kumartuli is considered as one of the chief attractions of Kolkata and as a visitor you may find the place very interesting. If you love photography, then it would be the best idea to visit Kumartuli before the national festival of Durga Puja. You may get some splendid pictorial object and may capture some moments with the busy potters. Kumartuli not only supplies the clay idols of different gods but also famous for exporting different artistic figures in various countries. There are numbers of famous artists living here and getting reputation all over the world. The idols made in Kumartuli have become very famous around the world. Numerous NRIs in various countries like US, Hungary and others seek for the idols of Kumartuli during different festivals. In this place you may find out some female idol-makers serving for years with their poor financial condition. You can find theme artists as well in Kumartuli.